Last update Elijah...very nice work. why? if you start out with all your armys over there it is goign to be unfair to you and you will proble lose, also how is it fair to treat the free states? you NEED to make it a bonus. its really no question.. Considering you get +5 with only 1 border at New York, I'd have to go for there. Of course the South-West is tempting too. I think it's the luck of the drop, just as in every other game... How about when you start a classic game and already own all of Oceania or S.A. while someone else has troops spread out across the board? First of all, I think this map is pretty nice. Some souther borders, like between Texas and Indian Territry, are a bit pixelated. But otherwise, I like it. And I see Lincoln is in there, up in the northern states. What about adding Jefferson Davis in the south? Just an idea, to me it seems like it should be there....But thats just me. Evil Pope wrote: First of all, I think this map is pretty nice. Some souther borders, like between Texas and Indian Territry, are a bit pixelated. But otherwise, I like it. Canada was in that war too you know! What about the Fenians? I would have to go wiht Elijah here. If this is ment to be a representation of the real battle then you cant have the neutral states giving bonuses... and anyway it adds spice to the game. You're a General in the American Civil War! 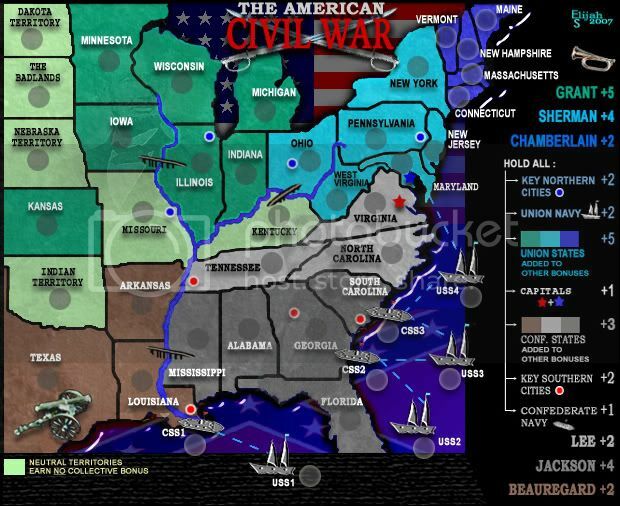 Would you try to command the forces of the Union or Confederacy? Jesse710 wrote: Canada was in that war too you know! What about the Fenians? This really did make me LOL... too fricken funny! Thanks for the compliments Coleman, cairnswk, Dancingmustard1 and soundout9. With the kind of support shown recently I'm hoping we'll all get to play this board in the near future! I think that the davis image balances out the map. besides, they aren't to obvious anyways, I had to look for a secnd before I found lincoln, and then a while longer before I found davis. I look forward to playing this map. First question-its these map historical acurate? question 1-Why you have so many diferent text fonts and sizes? question2-why Florida is cut in half? question3-what these numbers present -CSS2,USS3 and others? I think that best font for these map is letter what use in America in these time,these will be full score. Also yours borders is not same in all places. Bonus Box-must be much much better,now its look very low visualy. qwert wrote: First question-its these map historical acurate? -I used 3 different fonts in total. -The Union states and their corresponding items in the legend are one font; the Confederate states and their items in the legend are another; and the neutral territories are the third. -The Florida peninsula was cut to provide ample free space and didn't really add anything to the map or gameplay. -Several of the western states were also cut from being complete. -The borders look pretty consistent to me. -The Legend is straightforward and legible. It's not that I've been unyielding in this project. -Most of the improvements during the development of this map have come from suggestions that I felt were well-founded with good intention. This seemed more like suggestions on how I can make my map look like a Qwert map though, and I have no intention of doing that. -The shadows behind the army circles in the blue territories have been removed. -Chamberlain and Grant have switched places in the legend to make it more symetrical. -All bonus value numbers have been made one font and size. -The bonuses for holding all Union States or all Confederate States have been increased. -This should encourage players to try to gain the entire North or South and contribute to thematic gameplay. Put something behind the legend. I'm not sure if it's been discussed but it REALLY needs it. Might it be a little unbalanced to have the Union States giving a bonus of 8 and the Conf. States only giving 5.... the Conf. States get less as it is. Yes the Conf. States can get the Navys much more easily but the south side still ends up 3 armys done per turn. Also; if your going for symmetry, maybe switch"Key Southern Cities" with "Confederate Navy", or the reverse for the north. -First of all, a border has been placed around the legend. This was one of the most frequently brought up issues and, while I don't think it really makes a huge difference, I finally relented. -The "Confederate Navy and Key Southern Cities" in the legend have been switched. -The green in the "5" now matches the green in "Grant". The bonuses for holding all Union States and for holding all Confederate States seems to work for me; I think they're proportionate to the number of states you have to hold. -There's a lot more Union States than Confederate States, hence the bonus is higher.